While the world is celebrating the recent territorial defeat of ISIS, the Syrian Democratic Forces seem to be overwhelmed with efforts to preserve their gains. The group, which led the ground operations against the so-called caliphate in northeastern Syria, has won a crucial battlefield victory, but whether it will be decisive relies on its ability to put together a long-term counter-insurgency and reconciliation strategy. Long before losing its last village in Baghouz, ISIS had been preparing for its post-caliphate phase by planting or recruiting sleeper cells in SDF-controlled areas and elsewhere, which have already proved their capabilities with insurgent tactics. Meanwhile, the SDF is struggling to secure tens of thousands of detained ISIS fighters and supporters, much less begin reconciliation and reintegration in the region. Without attention to all of these issues, long-term stability in northeastern Syria will remain in doubt regardless of territorial control. ISIS’s deadly hit-and-run attacks in the northeast, including using improvised explosive devices, are on the rise. Clandestine cells are reportedly even conducting extortion operations and assassinations at night checkpoints. The number of these cells remains unknown, but SDF commanders fear the group has an extensive network across eastern Syria, with civilian residents still serving as informants. The SDF commander-in-chief, Gen Mazlum Abdi, recently listed the priorities in the next phase of the fight against ISIS, including eliminating sleeper cells, dealing with thousands of detainees and uprooting the ideology, but he has provided few concrete details. With the support of the international coalition, the SDF is conducting military and intelligence operations to identify and eliminate clandestine cells with the support of a network of local informants. But the secrecy surrounding ISIS’s operations and the lack of trust and resentment toward the Kurdish-dominated SDF trouble the counter-insurgency efforts. 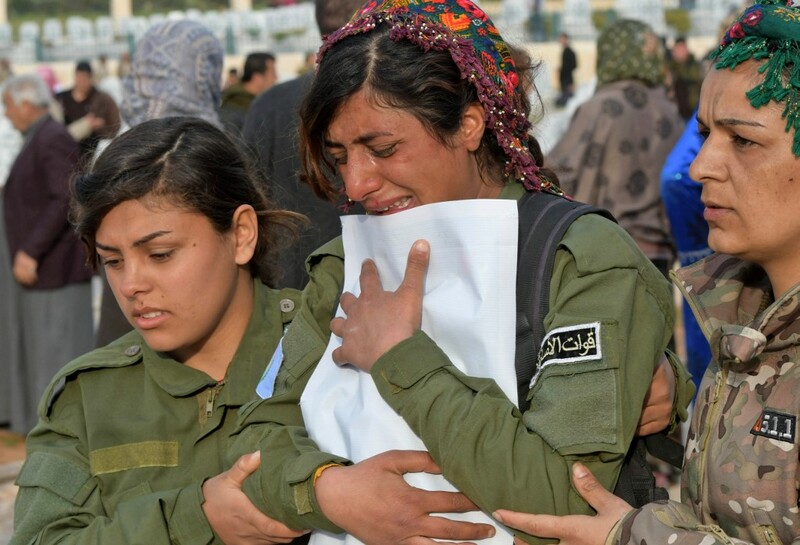 In addition to thousands of ISIS militants detained in recent months, including hundreds of foreigners, the SDF recently captured, at Baghouz, another 5,000 fighters and 55,000 civilians, many of whom have strong ties to ISIS. The numbers have swamped official detention centers, forcing the SDF to place even hardened militants in camps and schools that lack the necessary security. With the help of the coalition, the SDF is now fencing those facilities, installing bars on windows and increasing the number of security guards to prevent jailbreaks. Even at more secure facilities, where ISIS leaders and other high-profile or potentially dangerous figures are imprisoned, local courts under the SDF’s administration are seriously understaffed. In 2017, 674 people were convicted by terrorism courts. At that pace, the judicial process would take more than a decade to prosecute the ISIS members who are currently being detained. Partly because of that slow process, detention centers and camps are at risk of becoming breeding grounds for ISIS, reinforcing radicalization among members who currently might be less devoted to the “cause.” That pattern – and subsequent prison breaks – recall the reorganization in Iraq of Al Qaeda in 2012. By appearances at least, the SDF has not made much progress in its goal of uprooting ISIS’s ideology, in the apparent absence of official programs to rehabilitate current or former supporters. There have been limited reconciliation deals, however, with the SDF releasing local fighters who did not hold senior roles in the ISIS apparatus and are not accused of major crimes. Fighters qualifying under those criteria are being released following discussions with prominent tribal leaders in their communities, who are responsible for preventing them from re-joining ISIS. Judging from the SDF’s public announcements, a few hundred people have been released through this process, but the exact numbers are still unclear. The program has not been comprehensively assessed and details about some reconciliation deals, as well as official statistics tracking the releases, have not been made public. The involvement of local community leaders in the reintegration of former ISIS supporters is not enough to ensure positive results. For example, there is no clear effort to provide rehabilitation programs for released former fighters or follow-up mechanisms to assess their reintegration progress. The success of reintegrating local fighters into local society – and preventing their return to the ISIS fold – depends on more capacity-building, rehabilitation programs and counseling. The SDF’s clear priorities for the next phase in its fight against ISIS still fall short of such a comprehensive strategy capable of eliminating the long-term threat. At present, efforts are focused on short-term fixes to contain, rather than cure, the insurgency in its new form. Instead of trying to carry out a comprehensive strategy on its own, the SDF should work with civil society groups to find solutions to deep-rooted political, economic, social and cultural issues that have seen extremist groups rise and flourish. Western governments, who still have much at stake in the fight against this new form of ISIS, should step up efforts to increase financial and technical support to the SDF and Syrian civil society groups working in the field. In all likelihood, neither the SDF nor other Syrian groups can manage this counter-insurgency campaign on their own. Ignoring the urgency of a long-term plan, including increased support for those on the ground, will almost certainly allow ISIS to continue to destabilize Syria, prevent the country’s recovery and development and in turn undermine the security of the region and the world.